At a time when power cuts are disabling elevators and evening plans, and mounting tension surrounding upcoming elections leaves a stuffy taste in the air, it’s quite a relief to take advantage of Cairo’s charming, quiet side. And while it seems like charming and quiet can only be found on a beach resort three hours away, the desert just outside of town would disagree. 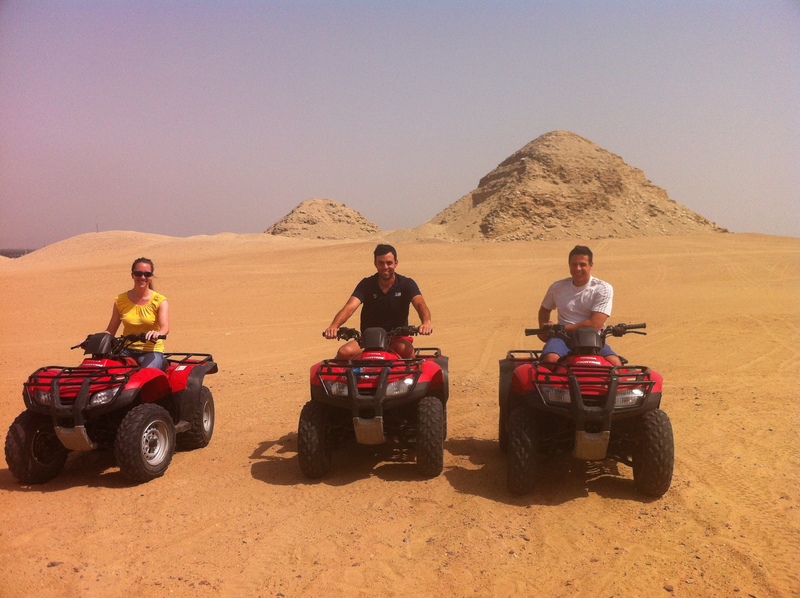 Quad biking by the pyramids is one of those things every expat does. It’s actually somewhat embarrassing to admit that after three years of living here, I still had never done it. 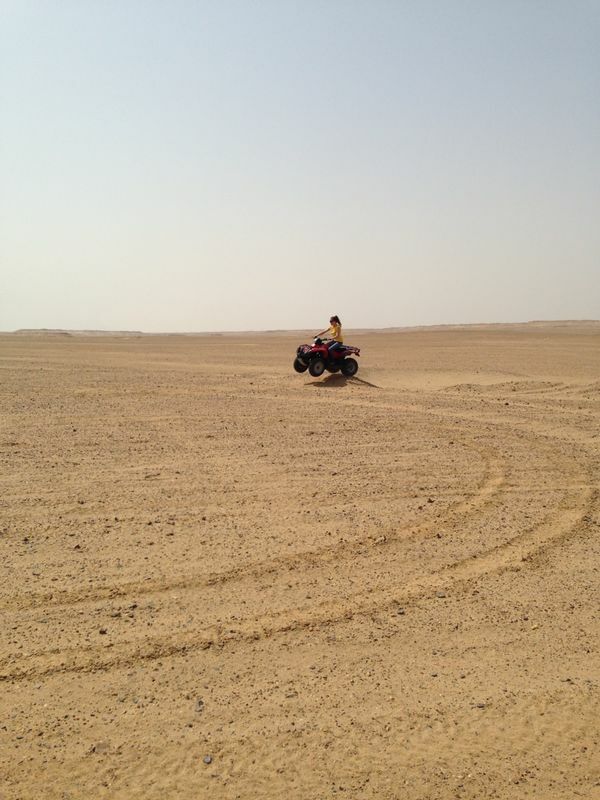 In fact, up until Saturday, I’d never been on a quad bike at all. I’d only ever associated quads with my cousin Chris, who along with his brother Ian, always seemed to seek out the riskiest activities. While Chris and Ian had been blessed with a reckless sense of adventure, I’d been given genes that were both clumsy and uncertain. On a ski trip, you might find Chris carving the side of a mountain on his snowboard while I would be found on my bottom under the tow rope, sustaining cranial injuries. Still, everyone does it, I reasoned, so it couldn’t be that bad. And after a 50-year-old colleague showed me a video of her pushing 42 km around Sakkara pyramid, I felt slightly more reassured. Once there, I signed the standard sign-your-life-away form that discouraged me from trying any wheelies or backflips or riding off into the Sahara by my lonesome. “You don’t have to wear helmets, but we strongly recommend you do,” the man informed me as he took my waiver. He then shuffled the three of us out toward the gate where three quads grumbled to life and there was a noticeable absence of helmets. Unconcerned, James and Antony leaped onto theirs while I eyed mine suspiciously, as if it might rocket away when I tried to get on. A small child, who had started the bikes moments earlier, urged me to get on. Not wanting to be coaxed onto the bike by a 7-year-old, I immediately hopped on and watched with rapt attention as a larger man showed me how to accelerate and brake, all through sounds and gestures. And then we were off. Well, James and Antony were off. I cautiously putted behind them at 25km, concerned I might accidentally rev the engine and collide with one of them. Our guide took us to Sakkara and then out into the desert where the pyramids of Giza silhouetted against the hazy Cairo smog. It’s amazing how long it takes to travel between the Giza pyramids and Sakkara by car (45 minutes minimum) and how quickly the distance is covered when flying across unobstructed desert. At one point, James doubled back to catch up with me. “What are you doing?” he called. But the highlight of the afternoon occurred at a bowl-like formation in the sand that boasted a small hill on one side. Curious, I watched as James and Antony circled around to the opening of the bowl, sped into it, and flew up the hill at the end and into the air. I had just gotten comfortable with speed and wasn’t sure I wanted to be airborne just yet, but they encouraged me anyway, telling me to take it slowly. 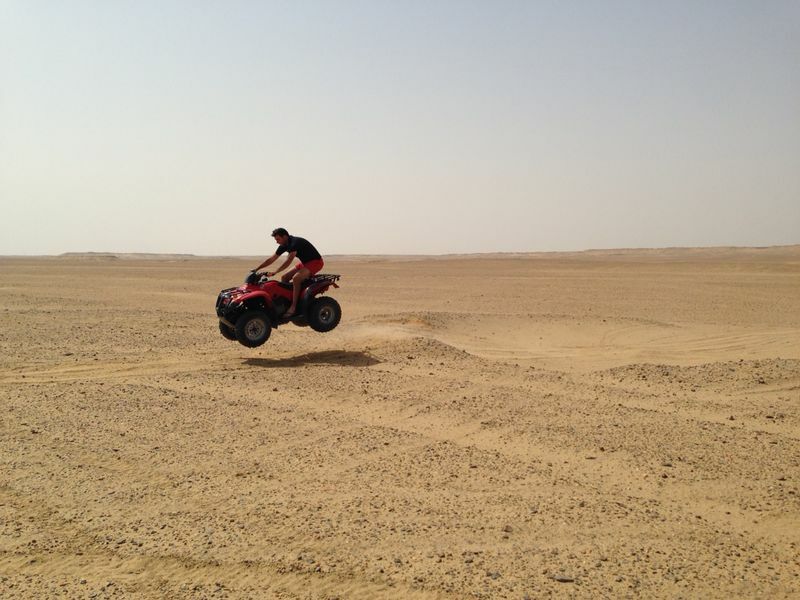 I rode into it at a comfortable pace, accelerated at the hill, and then suddenly – I was airborne. Just like that. I managed to easily land it on all four wheels, paused for a moment, then circled back to do it again with more speed. By the time we returned to the club, I felt easy speeding along at 60, taking hills and lumps and holes in a stride. 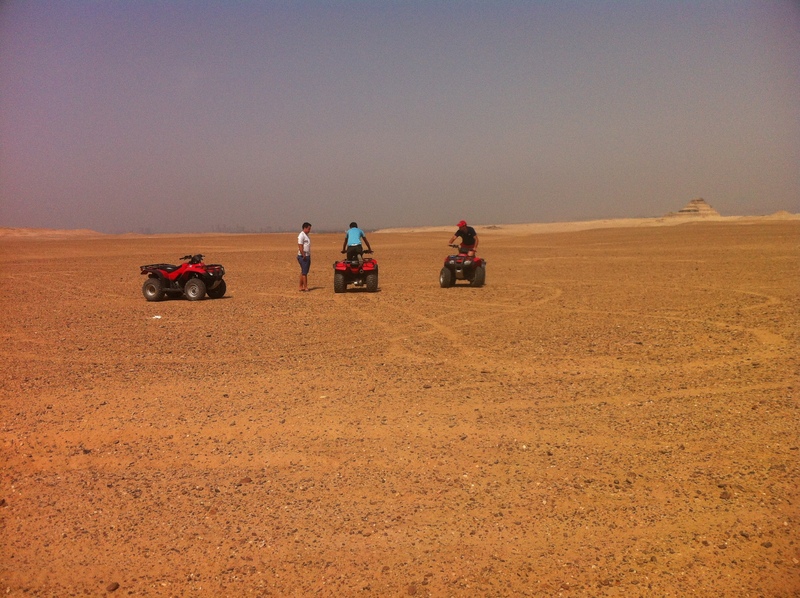 My companions flew up steep dunes and zoomed down the sides of them, spun around in series of sharp turns, and attempted one-wheeled tricks. I wasn’t quite ready for that, but as we rolled the quads back to where we’d retrieved them, I was feeling giddy with energy and my legs had the same shaky, adrenaline feel to them they had when I’d gone skydiving. We spent the next hour by the pool and I returned home sun-warmed and dizzy with adventure. And despite being surrounded by city, it’s unexpectedly silent in the desert, the kind of silent you hear at zero gravity or just after a snowfall – which is often exactly what you need after a long stretch in Cairo.